Can office workers be the new athletes? It might sound a bit unusual but we may need to start looking at desk workers like they are athletes and here’s why. We all know that there are tons of overuse injuries when it comes to endurance sports like marathon running, Cycling etc. We now know that sitting at a desk for over 8 hours a day also comes with overused muscles and joints, making us more prone to injuries. Even though you may believe your injuries are due to activities away from your desk at work. Some examples may be bending over to put your shoes on and feeling spasms through your back. A lot of the time, the issues we are having with our range of motion is due to injuries built up due to poor posture and lack of moving in your day. You then start to notice these issues slowly when you’re moving around the house or exercising. There are parts of the body that you should be strengthening to help prevent injuries. Watch out for Pec muscle tightness – You may not feel any tightness in this area until you have them massaged but this tightness can lead to mechanical issues in the shoulder and cause tightness in the back and trap area. These issues seem to show up a lot with patients who are doing a lot of burpees or pushups and are experiencing pain in the neck and upper traps. It’s important to move your neck around a lot instead of keeping it held in one basic position for hours. Make sure to use your deep neck flexors, preventing neck weakness. When there is weakness in the core of your neck, this puts an increased load on the discs and joints of the neck. To help reduce neck pain it is important to strengthen the deep neck flexors. When it comes to the lower back, specifically in the hips and back there are some things you want to look out for. 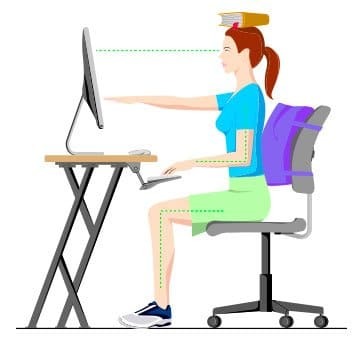 By sitting at a desk all day long with your hips at a 90 degree angle you may develop tight hip flexors because your hip flexors are shortened. Hip extension is limited over time. Runners beware that you depend on good hip extension so that you don’t extend too much in your lower back. Your lumbar discs may be affected due to the pressure caused by sitting in a chair slumped. This pressure could cause neurological issues and loss of strength. Just as an athlete would do, you’ll want to stretch, massage and loosen your muscles that are easily prone to tightness. Remember to stretch your quads, hip flexors, traps and pecs. When it comes to strengthening, work on your glutes, core, lower/mid traps and deep neck flexor.